Ellen has performed at elementary schools and worked with school orchestras on different styles of music, drawing from the large repertoire of music that the New Hampshire Fiddle Ensemble has performed over the past 10 years. Scroll down to see reviews from schools and libraries. For as long as she has been performing and with her professionalism, Ellen can easily draw from musicians far and wide. She also has a talented group of young students who can put on a good show. This group, Tangled Strings, is raring to entertain audiences of all ages. The NH Fiddle Ensemble also does smaller shows for groups throughout the year. 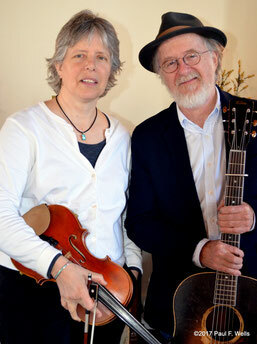 Ellen Carlson and Jim Prendergast's interactive fiddle programs for schools, libraries and other groups. An interesting and educational program for people of all ages! Ellen Carlson and Jim Prendergast's presentation explores various fiddling styles and what makes them the same or different. Their presentation includes learning how to hambone, how to do some Canadian foot percussion and perhaps even a dance. Contact Ellen if you want to learn more about bringing this workshop to your school or library. "Ellen's performance demonstrated confidence and joy and was truly engaging!" "Your program is the talk of the town today. What a great night! Also, thank you for going into the schools. The students loved it." "Thank you! Thank you! Thank you! You are a wonderful fiddler! We loved your music!" "These situations tend to bring out the best in students and I think you are above and beyond what everyone was imagining."